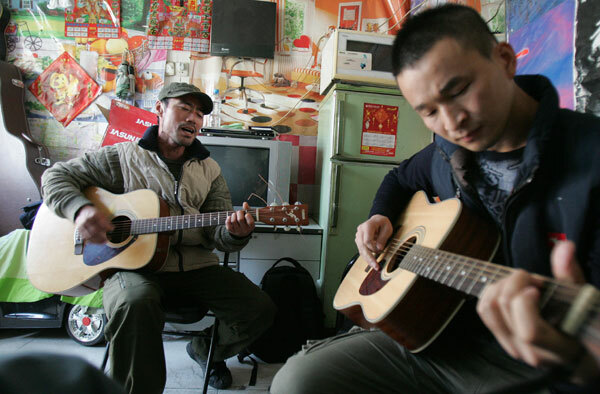 BEIJING - Until about a month ago, 44-year-old Wang Xu and 29-year-old Liu Gang were just two common migrant workers, who played music in the national capital's subways at night to make some extra cash. It was only on Saturday, when they sang their heart-rending version of In the Spring alongside the song's star composer Wang Feng in front of some 80,000 screaming fans at the Shanghai Stadium, that they realized they had turned into national celebrities. Wang, who hails from the central Henan province, and Liu, a native of Northeast China's Heilongjiang province, started their journey to fame in late August. The two were then singing the tearjerker song during an evening drinking session in a 6-square-meter rented room in Beijing's southwest suburb. A friend recorded the performance on a mobile phone and posted it on the Internet. In the video, the duo are shirtless and sweating. Liu sits playing the guitar, and Wang stands singing. "If someday I am dead, please bury me in the spring," they sing. Wang's penetrating chorus, delivered with his eyes closed, moved thousands of netizens to tears. "The friend who recorded the video told us that he had posted the clip online," Wang said. "To be honest, I was very worried - we didn't even have our shirts on while jamming. It felt awkward." Celebrities such as musician Xiao Ke and Hong Kong singer Charlene Choi recommended the video on Sina Weibo, the Chinese version of Twitter. And netizens termed the video the "cleanest post" ever, for all the comments that followed were positive. Neither Wang nor Liu had a clue that their journey toward fame had commenced until they started receiving an unprecedented number of phone calls and text messages in October. "Now, sometimes we barely get two hours of sleep because there are so many television recording sessions," Liu said. Liu came to Beijing in 2002, two years after he ended his military service. He had worked as a guard, roadside peddler, and porter. Busking was his main income, even after he married and became a father three years ago. "Normally, I can make 30 to 80 yuan ($4.5 to $12) in an evening, and more than 100 on my best day," Liu said. He recalls tougher times when he had to sell his aluminum pan for 2 yuan, to buy four mantou, or Chinese steamed buns, to eat. To support his wife and two sons, Wang came to Beijing in 2000 and worked as a boiler man and street peddler before becoming a medical warehouse keeper, with a monthly pay of around 1,500 yuan ($227). In September 2003, Wang started busking downtown Beijing's pedestrian underpasses at weekends or evenings. "I love music, and also want to earn some money to meet my daily needs," Wang told Xinhua News Agency. It was in 2005 that Wang first saw Liu singing in a subway passage and asked when he would finish so he could do his gig. Liu told Wang that he would have to wait a little longer because another street singer was waiting for his turn. "I was upset and decided that I would make it to the subway earlier the next day to take the spot," Wang said. The two bumped into each other again and again in the same subway until they decided to merge their talents. Besides performing in subways, the duo also tried performing in bars, but "felt very restrained", as they had to perform requested numbers. Their meteoric rise to fame has even warmed their initially unsupportive families. Wang said his wife now encourages him to play music because she knows it can bring home some money. Liu's parents, who always told him he was too old to become a musician, now motivate him to give it his all. But the two are still uncertain where their fame will lead. Wang has started learning to use a computer. They even have a micro blog account to communicate with fans. "We are happy and proud that so many people think the music video represents heartfelt expressions of migrant workers and the underclass," Wang said. Wang appealed to the public to be more understanding of migrant workers. "Please don't look down upon migrant workers, who may be less educated, but are kindhearted." Unlike in the West, street artists are considered mere beggars in China. Some passers-by cover their ears, some stare in contempt while others take aim at the singers with coins, Wang said. "I sometimes wonder if my singing isn't good enough," Wang said. "But music is my life." Even though Wang and Liu have gained too much fame to play music in subways without attracting a mob, they are certain never to forget their route to glory. "No doubt, we will sneak inside the subway to perform again someday," Liu said.